Allen & Heath has launched GLD OneMix, an iPad app that gives musicians wireless control of their personal monitor mix. GLD OneMix locks control to a single Aux mix, providing instant access to a customised easy-to-use monitor mix environment. 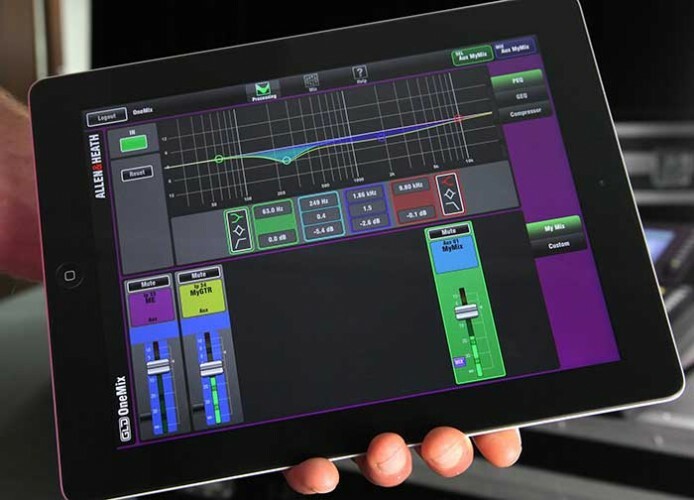 Multiple iPads can be set up by an Admin user to give numerous musicians personalised monitor control without affecting each other or the FoH main mix. A musician’s own aux monitor mix is assigned and locked into the ‘My Mix’ layer, and a selection of input splits dedicated to the individual musician can be added. Similarly, all other instrument send levels can be assigned to any of the three extra layers, allowing unique personal monitoring configuration. The range of accessible settings is defined by custom permissions for each layer. When in User mode, the musician is presented with simple-to-use access and control of their aux master level and processing, instrument send levels and processing, if enabled. Depending on the application and the performer’s technical knowledge, the layout and level of access can be kept minimal or extended to a more complex musician’s monitor mix involving a high channel count across multiple layers. Notably, the mix can be tweaked and listened to by both the user on stage and the sound engineer at the desk, enabling easy interaction between the two. Up to 16 iPads running OneMix can be connected to a GLD system. "Joining GLD Remote, OneMix offers yet more control options for the GLD system. OneMix is a customisable solution for personal monitoring, drilling down the mix into very simple local control for performers without affecting the greater mix environment. OneMix also complements the ME distributed personal monitor system and ideal for wireless In-Ear users who can have a complete wireless system with this app," comments Nicola Beretta. In picture: the OneMix app.